An easy to cook tilapia stewed in vinegar, soy sauce and garlic. The same method of cooking pork adobo but only for a shorter time because fish requires shorter cooking time. And this is a healthy dish too because fishes like tilapia has almost no cholesterol unlike pork and rich in omega-3 fatty acid that is good for the heart. 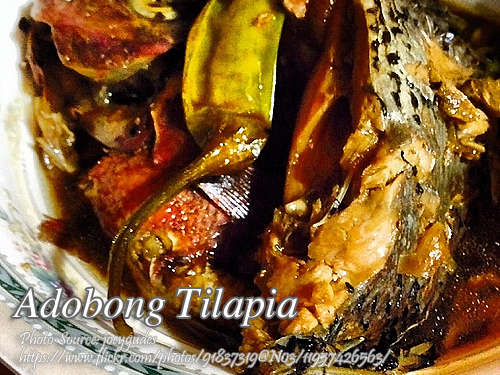 To cook adobong tilapia; Remove internal organs and gills if not yet removed when you bought it on the market. Scrape scales of fish. Clean. Arrange on shallow pan. Add all ingredients. Cover. Let boil, then lower heat and cook for 15 to 20 minutes. Serve hot with steamed rice. Remove internal organs and gills if not yet removed when you bought it on the market. Scrape scales of fish. Clean. Arrange on shallow pan. Add all ingredients. Cover. Let boil, then lower heat and cook for 15 - 20 minutes. Nice one, simple and yet tasty way of cooking tilapia. My kapampangan mother (God rest her soul)used to prepare this for us but with one more ingredient than above: tausi (black beans). I think I’ll be a frequent visitor of this blog as I am starting to cook for myself. I hope I could also ask you things related to cooking every now and then.